Anatolian Impressions: Artists’ Prints from the Istanbul Studio of Master Tekcan included a selection of prints made in the workshop of Master Printmaker Süleyman Saim Tekcan. Tekcan is one of Turkey's best-known artists and educators. Believing that original prints make art accessible to more people, Mr. Tekcan developed a unique printmaking process which has drawn artists from around the world to his Artess Çamlıca Printmaking Studio in Istanbul. Meridian International Center, Tekcan, Artess Çamlıca Studio, and the Istanbul Museum of Graphic Arts collaborated to present more than 70 works made in Tekcan’s studio. 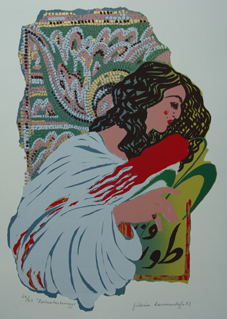 Prints and serigraphs made between 1940 and 2004 were featured in this exhibition to show examples of the work accomplished by well-known artists of several generations.